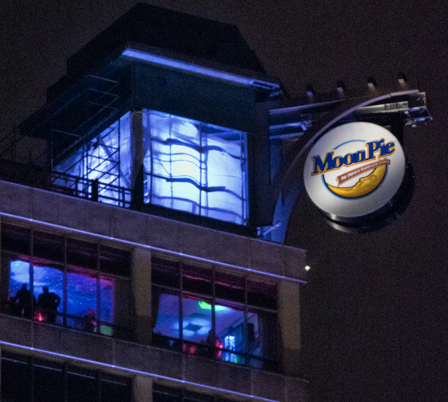 Here’s an inventive use for a staple snack: Drop a giant MoonPie from a tall building to mark the New Year. 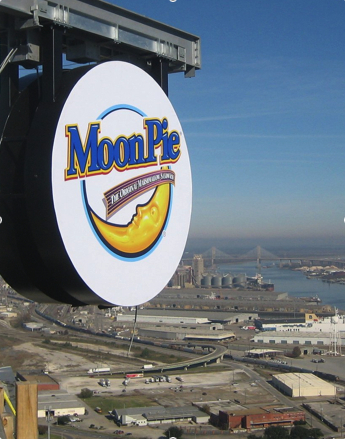 Everyone knows about the giant crystal ball that descends in New York’s Times Square on New Year’s Eve, but have you heard of the giant MoonPie Over Mobile that serves a similar purpose down South? As midnight approaches on December 31 in downtown Mobile, Alabama, a huge, shining, plastic, electrified likeness of a MoonPie — measuring 12 feet across, weighing 350 pounds, and brightly illuminated from within — drops from the top of the 34-story RSA BankTrust building. It plummets 317 feet in 60 seconds and stops at the 6th floor, directly above a crowd of street-party revelers on St. Joseph Street and St. Francis Street, just as the countdown ends and both January 1 and fireworks begin. The free event, which drew an estimated 40,000 people last year, begins with a 7:30 p.m. parade, continues through a series of live concerts and a laser lights show, peaks with the midnight MoonPie Drop, and concludes with wee-hours restaurant and bar hopping. This year’s featured band is Three Dog Night, which will undoubtedly play suited-to-the-occasion hits “Joy to the World” and “Celebrate” and, who knows, might even play “Mama Told Me (Not To Come)” and “An Old Fashioned Love Song” too. You might be asking: What does MoonPie have to do with Mobile? Try to follow this reasoning: 1) Mobile hosted the America’s first Mardi Gras celebration in 1703, before nearby New Orleans began its famous version, and takes great pride in the long-running annual tradition. 2) MoonPie is a favorite treat for Mardi Gras parade-float riders to throw to people who line Mobile streets and watch. 3) Mobilians typically consume more than four million MoonPies annually, and many consider the cellophane-wrapped goodie to be an unofficial emblem of the city. 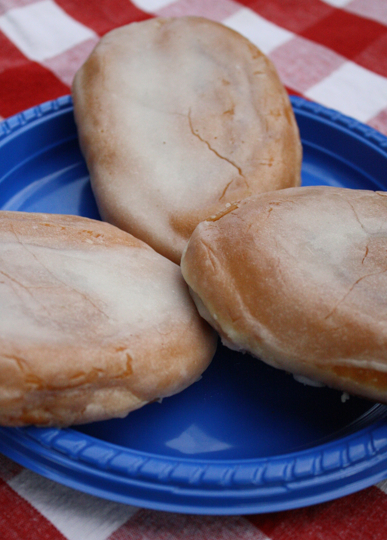 4) If MoonPies are good enough for Mardi Gras, they’re good enough for New Year’s too. 5) Hey, does anyone really need a reason to do silly things like this on New Year’s Eve? MoonPie aficionados (they are legion) will point out that the MoonPie is more closely related to Chattanooga, Tennessee. That’s where the iconic chocolate-covered-graham-cracker-and-marshmallow sandwich cookie originated in 1917 and where Chattanooga Bakery Inc. continues to produce them at the rate of about a million a day. The bakery teamed with Mobile to create the giant electric MoonPie for dropping during the city’s New Year’s Eve celebration. With that cleared up, one key question remains. Will you wash down your celebratory New Year’s Eve MoonPie with RC Cola or champagne? Either drink goes well with it. Happy 2012! Put a little Dough! Dough! Dough! in your Ho! Ho! Ho! 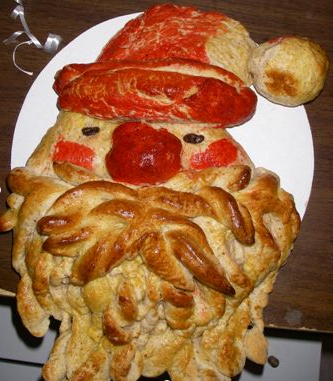 This Santa Bread photo came to me from Joan, a loyal subscriber to the Bakery Boy Blog and a friend and neighbor of my sister in Virginia. Joan works at a physical rehabilitation center and says a thoughtful patient presented this homemade flaxseed Santa Bread to the staff as a token of her appreciation. I’m glad Joan took a minute to snap this picture before she and her coworkers tore into their holiday treat. Seeing it reminded me of various shapes my father made out of bread at the Dutchess Bakery where I grew up in Charleston, West Virginia. He’d make Santa heads, reindeer, Christmas trees sleighs and more, all out of creatively shaped bread dough. For some reason I’ve never figured out — since we didn’t live in alligator country — my Pop made alligator bread complete with scissor-sniped spikes running along the backs and tails and with mouths propped wide open through a clever arrangement of folded cardboard during proofing and baking. Maybe he just made them because he could and because it was fun, which would be reasons enough. I made some recently just to see if I could remember how. 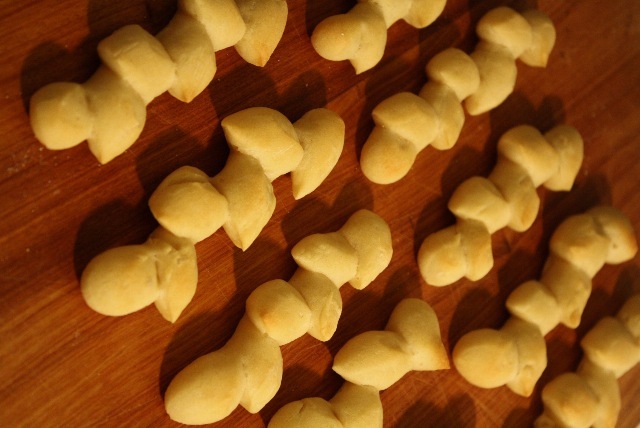 They turned out well and kindled a fond memory, just like Joan’s Santa Bread photo did. For a couple of years while I worked as a baker at Le Panier Very French Bakery in Seattle’s Pike Place Market, I made elaborate holiday stars out of braided bread. Some were nearly a yard a wide, great for dangling in the shop’s windows as bakery-themed decorations. Others were about the size of a regular loaf, used as table centerpieces for parties. The smallest would fit in the palm of your hand and served as Christmas tree ornaments. Good times. I’ve also seen bread shape like a cable car and a sea lion in San Francisco, bread shaped like a cactus and a fish and a donkey-pulled cart in Albuquerque, and bread shaped like a lobster in Maine. Someday I should write an article all about bread shaped to look like something other than bread. There’s no recipe or how-to lesson with today’s post. You can find plenty of those just by entering Santa Bread into any search engine. TasteOfHome.com has a nice version and so does MarthaStewart.com, to name just two. Or you could just take your favorite bread dough recipe and wing it, using your imagination and maybe a little well-placed food coloring to devise your own version of Santa Bread. Maybe it’ll turn out great or maybe it’ll be an absurd mess, but either way you’ll have a little fun and create a new holiday memory. Whatever interestingly shaped bread you make please snap a picture and send me a copy (find my email link at bottom right). I’d like to put together a slide show of the best and the worst — as well as the funny, the odd, the what’s-that-supposed-to-be? and other gallant efforts — for a blog post to run next year at about this time. 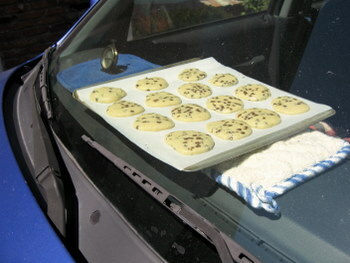 Fellow bakery blogger Nicole Weston of Baking Bites shares her technique for baking chocolate chip cookies on the dashboard of a summer-hot car. It’s August. It’s hot. You park your car in the sun, and when you get in to drive somewhere the heat is unbearable. Maybe you roll down the window and drive fast to flush out your rolling furnace. Maybe you crank up the AC and wait a few minutes in nearby shade. Here’s an idea. When you’re not going anywhere, why not use that hot-as-an-oven car as, well, an oven? Fellow bakery blogger Nicole Weston of Baking Bites explored this notion and developed what has become one of her most popular posts. First published in 2007, the story frequently earns a button at the top of her home page, even four years later. 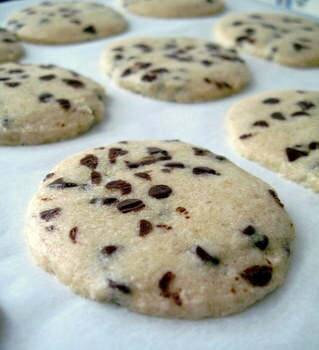 These chocolate chip cookies will be ready soon, and the car they're baking in will smell wonderful too. It’s a fun piece. The reader comments are worth scrolling through both for more car-as-oven tips (an Arizona woman says she cooked a steak to well-done in four hours) and other suggestions (such as using the resulting aroma of fresh-baked cookie to help sell a used car). Here’s the full URL linking to Nicole’s story, including her cookie recipe: http://bakingbites.com/2007/09/car-baked-chocolate-chip-cookies-step-by-step/. Or just click here. Thanks, Nicole, for keeping this story prominently displayed at your site. It’s an inspiration to us all! 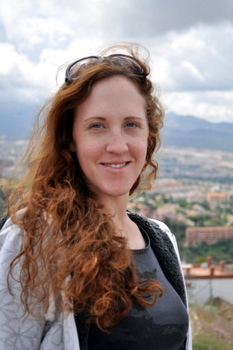 When Nicole Weston isn’t baking, photographing, and writing for her Baking Bites blog, which she launched in 2004, she is often riding horses (American Saddlebreds) or dancing (ballet and salsa). Based in Los Angeles, she holds a degree in linguistic from the University of California Berkeley and a certificate in professional pastry from the New School of Cooking in Culver City (across from the historic Helms Bakery complex, which now holds a collection of restaurants and design and furniture shops). Got a bakery-related story idea for the Bakery Boy Blog? Email a note to Bakery.Boy@att.net. Bob Dylan turned 70 and my Bakery Boy Blog turned 1 the same week recently. I’m a big fan of both Bob and baking, so for me his lyrical references to baking or baked goods or even basic ingredients commonly used in baking always stand out. Okay, so these aren’t songs actually about baking, just songs with key words that, for me at least, invariably trigger thoughts about baking, my favorite subject. Here are a few tasty Dylan lines, listed alongside the albums on which they first appeared. If you know of others, please tell me (leave a comment) so I can include them on a mix CD I’m pulling together to listen to when I travel to visit more bakeries. The bread ornaments I made 25 years ago are holding up pretty well, so this month I made more to give as gifts. 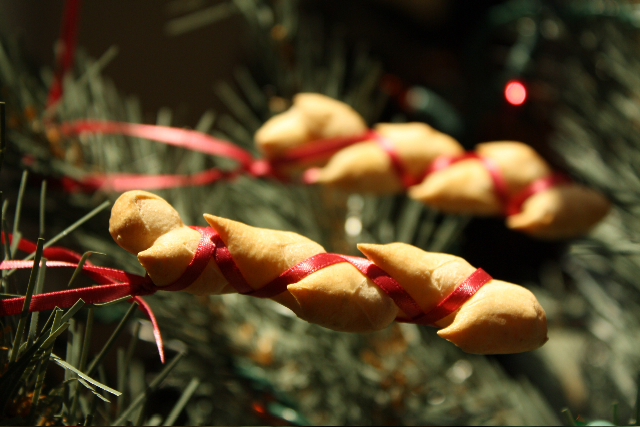 Hanging little loaves of bread on the Christmas tree seems quite natural to us bakers, I suppose. As conversation pieces, they’re hard to beat. As housewarming presents at holiday parties, or simple gifts for neighbors and co-workers, or stocking-stuffers for family members, they’re fun to make and pretty much guaranteed to bring a positive reaction. I decorate our tree with some miniature bread ornaments I made 25 years ago while working in a French bakery in Seattle. Some are four-inch-long versions of French loaves, scissor-snipped into alternating pointy “grains” to resemble ripe wheat tassels. Others are shaped into 1½-inch-diameter wreaths just the right size to hold small candles in the middle and sit upright on tree branches. I wrap the straight loaves in red ribbon that doubles as a hanging loop at the top end, and I use paper-and-wire twist ties from bread bags (how appropriate) to strap the round wreaths onto Christmas tree branches. 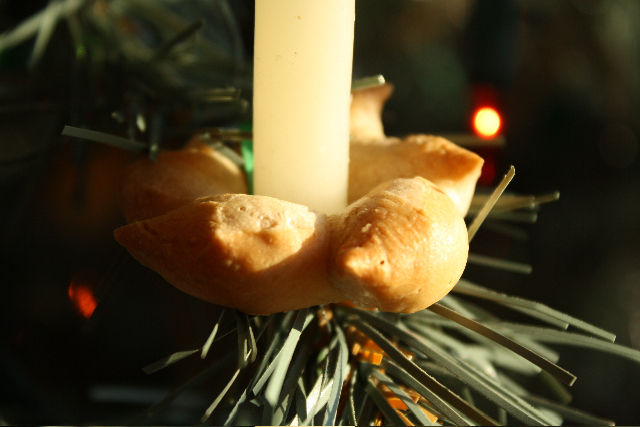 Wreath-shaped bread ornaments hold candles. Over the years I’ve gradually lost some of my original bread ornaments to breakage while getting them into and out of storage or on and off the tree. So this year I decided to restock my collection and make extras to give as gifts. Reactions to receiving the little favors usually go something like this: First a look of genuine surprise, followed by some variation of the phrase, “Are they really made of bread?” Next comes an appreciative smile of thanks. And finally the urge to hang them right away in a place where they’ll be seen. What more could a devoted baker-turned-ornament-maker want? 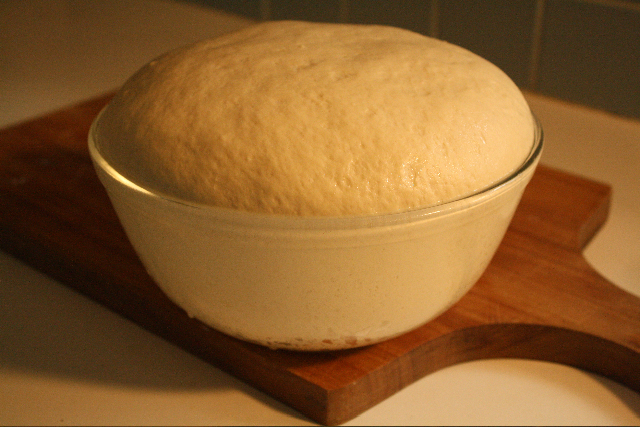 Start with a basic French bread dough. HERE’S HOW Start with a basic French dough of just flour, water, salt, and yeast—nothing like butter, oil, sugar, or eggs that will attract critters while in storage. I make a large enough batch to bake a regular loaf or two to eat right away and still have plenty left for making a few dozen ornaments. 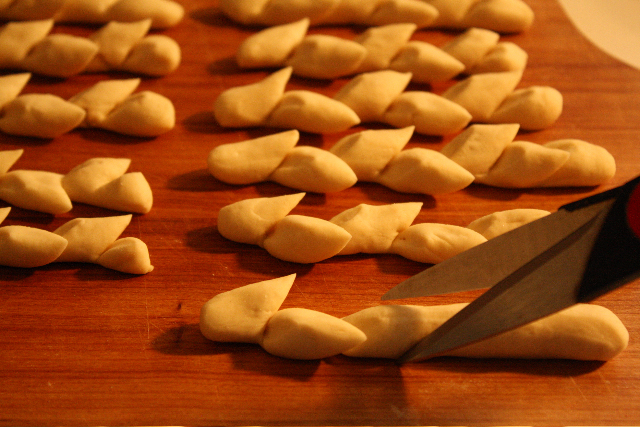 Snip the mini-baguette into points alternating left and right to resemble wheat tassels. When it has risen (that’s more of an Easter reference, I know, but bear with me), divide the dough into pieces about the size of ping-pong balls and roll them into four-inch “fingers” or mini-baguettes. Let them rest a few minutes, either on a cutting board to be moved gently later, or on cookie sheets lined with parchment paper and ready for the oven. Cut at a 45-degree angle about 3/4ths of the way through the dough. Holding scissors at a 45-degree angle, snip each piece half a dozen or so times at equally spaced points, cutting about ¾ths of the way through to leave a solid line on bottom for a sturdy “backbone” effect. Set each little point off slightly to the side, alternating left-right-left-right. The results will resemble the rows of grain in harvest-ripe wheat tassels. 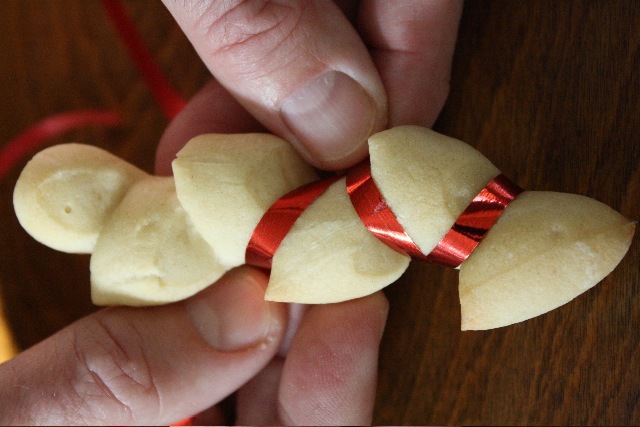 For wreath-style ornaments, form some of the bread “fingers” into circles about 1½-inches in diameter, leaving a center hole about the size of a small candle. Snip the dough at an angle 45-degrees to the center of the circle with the points aiming out. Cool and dry thoroughly. For longer-lasting ornaments, coat with varnish. Let the shaped dough relax and rise another 20 minutes on parchment paper-lined cookie sheets, then bake at 350o for about 10-15 minutes or until they start to turn golden brown. TIP: Under-baked, they’ll tend to sag and bend; over-baked, they’ll be brittle and more likely to break. Let the ornaments cool and dry for a day or two. Eat any that don’t look so well, but be careful not to eat the entire project or you’ll have to start all over. This is why I bake a regular loaf at the same time, so I can eat it while I’m making ornaments. 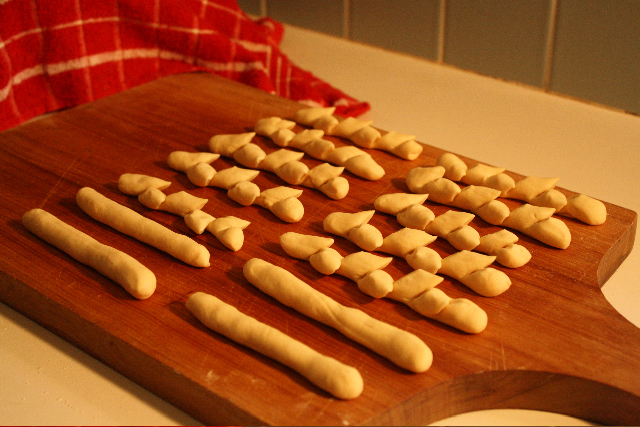 If you really want your bread ornaments to last a long time, spray them with a thin coat of clear lacquer or varnish. Allow them to dry thoroughly before applying decorative ribbon. This also provides the kind of shine you would get with an egg-washed surface. Even without this extra treatment though, they’ll be good for a few years before they start to shrivel and crack. Form a crisscrossing pattern with bright-colored ribbon. Wrap each straight ornament with a thin, brightly colored ribbon to form a crisscrossing pattern like calf straps on gladiator-style sandals. 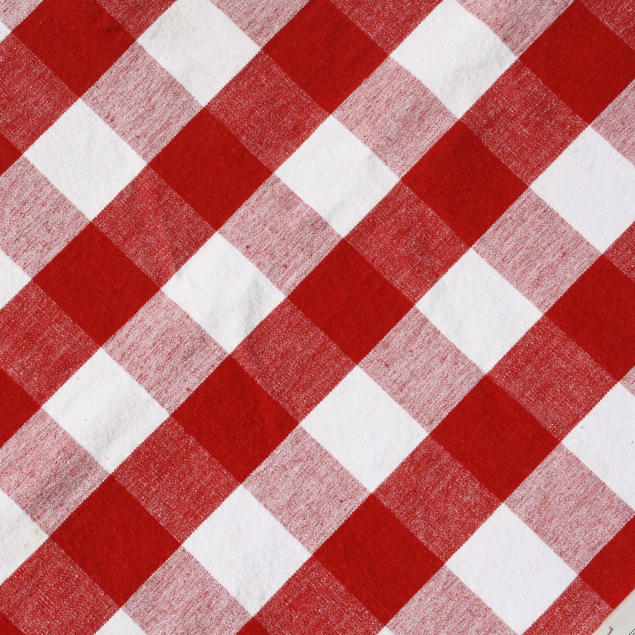 I use red ribbon, but any color that doesn’t too closely match the bread itself will do. Run the ribbon into the channels made by the scissor cuts, which will keep it from slipping. Tie the ribbon once snugly at the top of the ornament to hold the crisscrosses in place, and then again a couple of inches away to form a loop for hanging the piece. Square knots will suffice at both junctures. Or you could get fancy by tying bows for the second knot. Trim away any excess ribbon. 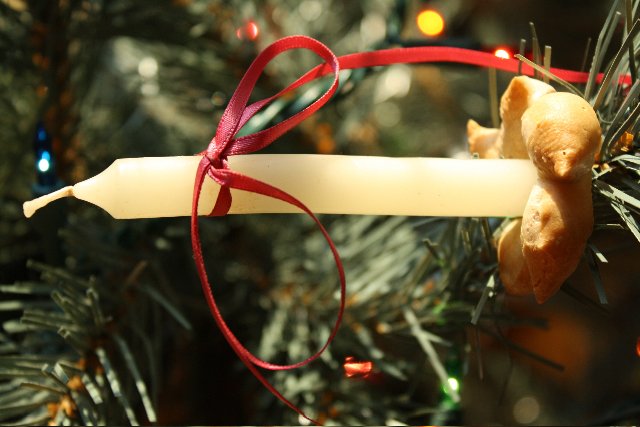 A bread bag twist-tie holds each candle wreath onto the tree. For each wreath ornament, gently push the bottom end of a small candle snugly into the center hole and tie ribbon into a simple bow on the candle itself. Use paper-and-wire twist ties, recycled from store-bought bread bags and laced through the center hole, to strap the ornaments to Christmas tree branches with the candles aimed up. NOTE: These candles are not intended for lighting, just for looking good. 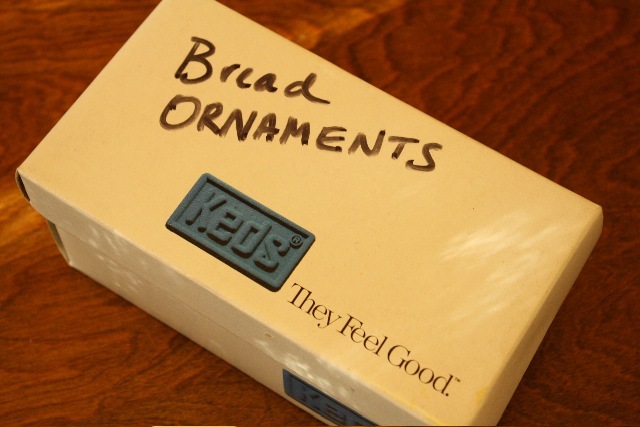 A child's shoebox holds my bread ornaments between Christmases. 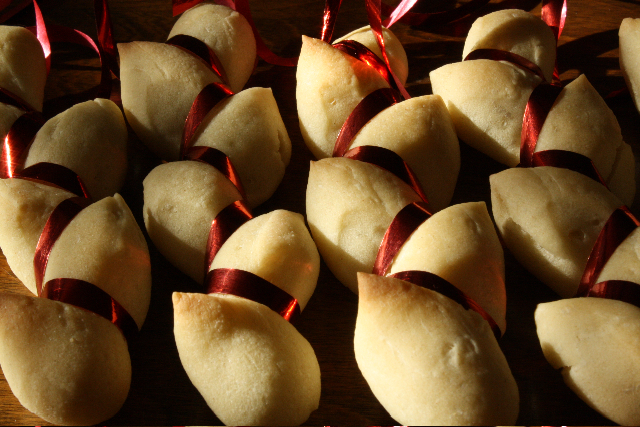 When you take down your decorations, wrap each bread ornament in tissue paper and store them in a small shoebox. For many years I’ve had mine in the same box my firstborn’s first pair of sneakers came in! GOT MORE IDEAS? Feel free to share your bread ornament ideas with fellow bakers by leaving a comment below or by sending an email to the Bakery Boy Blog at bakery.boy@att.net. Finished bread ornaments, ready to hang or to wrap as gifts. We pause in our pursuit of terrific bakeries to remember that, during tough economic times, we need terrific bargains too. Let’s see what $5 will buy at a bakery outlet store. For this website I usually seek out the very best bakeries. I don’t hesitate to shell out $5 for what promises to be a great loaf of, say, sourdough walnut raisin rye. In my book, a single fantastic napoleon is well worth five bucks at an independent bakeshop where craftsmanship rules and quality counts. When price matters, go for quantity over freshness at a bakery outlet store. But I also remember times—for me it was during college and between jobs, for others it might be after layoffs, divorces, or unlucky casino nights—when I had to stretch every penny. For some it’s an unfortunate daily fact of life. Maybe you recall such scraping-bottom times in your own life. Maybe that time is right now. Well then let’s drop by the local bakery outlet store and rediscover bargains on staples as well as splurges. These won’t be oven-fresh works of culinary art, but simple square slices will suffice for a basic bologna-and-cheese or peanut-butter-and-jelly sandwich, and cellophane-wrapped sweet rolls will do, in a pinch, if dunked in strong coffee or warmed by microwaves. I went to three different major-brand bakery outlets, one-story rectangular buildings sitting near large bakeries or warehouses with trucks backed up to loading docks. My mission: round up what $5 could buy. Simply, sweet, and a bargain at 3-for-$1. WHAT I FOUND At each place I saw 99-cent loaves of basic white or wheat bread, close to but not past their expiration dates. That’s five loaves for $5 with a nickel back, which could go toward paying sales tax in regressive states that still tax food. One outlet had some must-sell 79-cent loaves, which comes to $3.95 for five, leaving $1.05 to buy a trio of 3-for-$1 honey buns or cherry pies. I saw six-packs of coconut-and-fluffy-icing snowballs at two for $2.50, an extravagance in this experiment but one that left half the budget for buying a couple of eight-packs of hot dog and hamburger buns marked $1.49 each. That leaves two cents to tip the register clerk who patiently puts up with bargain hunters, both the truly desperate and the merely curious. Most likely she’ll toss the pennies in a put-and-take tray to help the next customer who comes up a little short. YOU GET WHAT YOU PAY FOR Admittedly these aren’t the freshest baked goods. They’ve sat on supermarket shelves until, with sell-by dates approaching, they are transferred to outlet stores for one last chance at maybe breaking even on production costs or at least losing less. Why the generic photos here? It seems the big bakeries don’t like publicity about their outlet stores. I wasn’t allowed to take pictures inside and was warned that if I showed their logos they’d have a problem with that. If I hadn’t already known where to find them, I wouldn’t have been able to look them up because they’re rarely noted in phone books or on companies’ websites. I guess their main objective is to sell as much as possible at the regular price through the chain stores they supply, not to promote the idea that you can buy for less at the outlet if you’re willing to sacrifice freshness. I see their point. It’s a sound business decision. Banning cameras seems extreme, especially since giant signs with bright logos on 50-foot poles mark many stores. Anyway, I’m not trying to give free publicity, wanted or unwanted. I’m just testing my theory that, when needed, bargains can be had. HALF-BAKED IDEA? I’m filing this essay under Half Baked Ideas, but maybe it’s not so half-baked after all. It’s more of a reality check. It’s about savoring a few dense yet somehow spirit-lifting powered-sugar mini-donuts on a Sunday morning after a week of fruitless job hunting. It’s an inexpensive loaf to get by on for now. It’s a chance to come home with something in a bag instead of nothing. YOUR TURN If you feel inspired to repeat my experiment with your own $5 budget, please let me know what you decide to buy and why. I learned something about myself in the process, and you might too. All you “knead” is love. It fascinates me how bakery stories can rise out of nowhere at unexpected moments. I was driving to visit a bakeshop for this blog the other day and heard something on Sirius-XM Radio that suddenly put The Beatles into a bakery perspective. Two Beatles were, like me, bakers. And no, I didn't actually heat the oven for this shot! Photo by Bakery Boy. Deejay Dusty Street, who broadcasts her Classic Vinyl show daily from The Rock and Roll Hall of Fame and Museum in Cleveland, Ohio, was introducing a John Lennon song from his last album, recorded shortly before he was murdered in 1980. She mentioned how he spent the last few years of his life cocooning with wife Yoko and baby Sean in a New York City apartment where, as a homespun hobby, he baked bread. Okay, cool, so a Beatle was a baker. Makes a bakery-born Bakery Boy like me proud to be in such company. Then I remembered how original Beatles drummer Pete Best, who was replaced by Ringo Starr, left what must have seemed at the time like an iffy future in pop music to take steadier work in, sure enough, a bakery. This was right before the group hit it big in 1962. Some call Pete the unluckiest man in the history of Rock & Roll because of that move, though decades later he formed the Pete Best Band and got back into performing. So it turns out these two baking stories—one about an original band mate, the other about the first band mate to die—form bookends to the Beatles story. I began thinking about (and humming) Beatles song lyrics that mention baked goods. Surely there are more. Let me know if you come up with any others. I’m not sure what the “finger pies” referred to here are exactly, and I don’t think truffles, Savoy or otherwise, count as baked goods. But the sweet sentiment is clear. 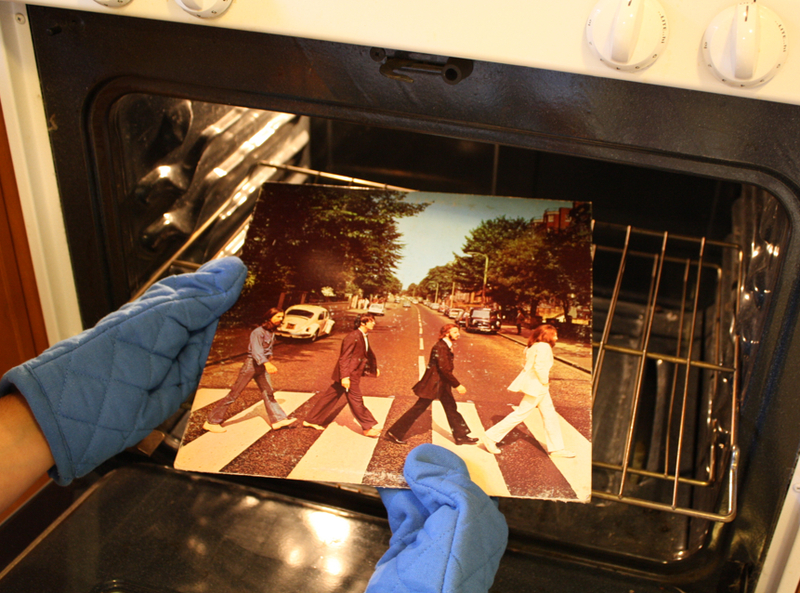 Have you thought of any tasty Beatles baked-goods lyrics to add? If so, click the comment button below and let me know! Bakery Boy photos are available to buy. Email bakery.boy@att.net. Enter your email address and you'll receive notices of new posts. I love bakeries! Sign me up! Got a favorite bakery? Send suggestions to Bakery Boy. 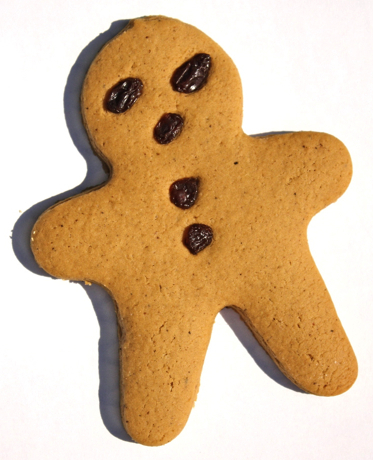 Click gingerbread man for email link. © Copyright 2010-2015 by Bakery Boy Blog. All Rights Reserved.